March 12, 2017, 5:49 PM · In late January, after the first of the recent U.S. travel bans was signed, Los Angeles-based violist and violinist Andrew McIntosh put a post on Facebook looking for recommendations of violin repertoire by living composers from the affected countries. "The response that I received to that post was astounding, with many friends and acquaintances chiming in with suggestions, mostly of music by composers from Iran," McIntosh said. "I ended up being in touch with composers all over the world and being introduced to some truly wonderful new music." As a result, he has organized a free concert that will be presented at 8 p.m Tuesday at Boston Court in Pasadena, Calif.: A Musical Gesture of Welcome and Openness: Presenting the Work of Seven Iranian Composers. 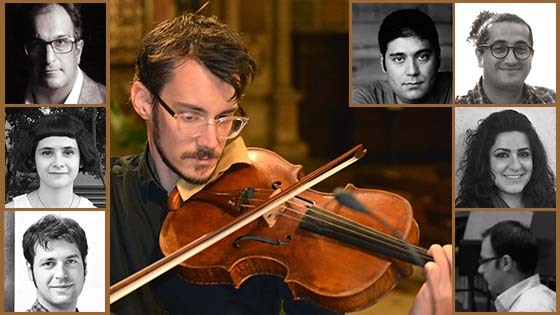 McIntosh will perform contemporary works for solo violin, as well as duos with pianist Richard Valitutto and soprano Stephanie Aston. The featured composers are Anahita Abbasi, Sina Fallahzadeh, Ashkan Behzadi, Idin Samimi Mofakham, Arash Yazdani, Amir Mahyar Tafreshipour, and Aida Shirazi. Boston Court is hosting the event, and all musicians are volunteering their time to perform. Andrew McIntosh and the seven Iranian composers whose music he will perform. McIntosh, who also is a composer, planned the concert because "I love the music that I was introduced to, and wanted to perform it," he said. "Early on in the process, I thought of the event as a political gesture, providing a voice that seeks to reshape the narrative we hear daily on the news about Iran or other Middle-Eastern countries. I am deeply saddened by the current politics and events in America, and this concert is my way of responding to that publicly." "Once I started interacting directly with Iranian composers, though, the human connection quickly became the most important part," he said. "It is important to me to place the focus of the event on its musical content and on the featured composers' work, rather than just using it as a vehicle for a message. I programmed their music because I am interested in what they have created and I am looking forward to sharing it. Of course, they are all from Iran, and the fact that this concert is happening is politically charged in the current climate, but I feel that a simple concert is the most respectful and straightforward way that I can extend a voice of welcome and openness. I hope that many other Americans will also find ways of expressing their own voices of welcome and openness, and that those voices will combine to change the hateful rhetoric and damaging actions coming from other parts of our society." For composer Aida Shirazi, the concert has been a boost during a difficult time. "I, like many others coming from the countries affected by the travel ban, have been through tough days and feelings," said Shirazi, who was raised in Tehran and is a permanent resident of the U.S. She is a Ph.D. student in music composition at the University of California-Davis. "Although I moved to the U.S. (only) about six months ago, the enormous love and support of so many caring, compassionate Americans, from friends and colleagues to my professors, has helped me deal with the unpleasant feeling caused by the recent occurrences." "Obviously, the professional support coming from my colleagues plays a crucial role in my artistic life in these hard days," she said. "It encourages me to continue working hard and being productive, knowing that no matter what happens, my music will be performed by the great musicians who value art and humanity over politics and borders." McIntosh will perform her work for solo violin, "One Day The Bird Will Be Free." Though her works have been performed in the U.S. before, this will be her first work to be performed in the U.S. since she has been living here. McIntosh said that above all, the reason he wanted to explore the music of Iran was simple curiosity. "I am not going to pretend that I know much about Iranian culture, other than having seen a few Iranian movies and read a few Iranian books, but I know that Iran is a modern, bustling, beautiful place, full of many highly-educated, generous, and creative people - many of whom probably feel as conflicted about their own political situation as I feel about mine," he said. "I am not going to make assumptions about what the people who live there are like based solely on the dramatic headlines I see in our news, and I hope that others around the world would also not judge me based solely on what they read about America in their news. So, I've been curious for a while to know more about people who actually live in Iran or come from Iran, and this was a way of exploring that. Also, the majority of the composers I was introduced to after my recent Facebook post were from Iran, so it made sense to make that the theme of the concert." "Iran has an ancient and rich musical heritage that I have been fascinated with for years," McIntosh said. "Being a violinist, I particularly love the repertoire of the kemancheh, a Persian cousin of the violin. Before putting together this event, though, my familiarity with music from Iran was limited mostly just to this cursory interest in traditional Persian music and I knew very little about contemporary music in Iran. I have been delighted by the wealth of new repertoire that I've been introduced to, and I wish that I had begun this investigative journey many years ago." "The music I've selected for this program is varied, but much of it would sound more at home in a 'new music' concert than in a Persian music concert, although there are subtle traditional Persian influences in a few of the pieces," he said. "There will be a delightfully wide range of techniques on the violin, from florid harmonics to subtle nuances of timbre to wild spectral sounds created by putting blue tac on the strings. I think all of the pieces could be described as exploratory to some degree, and in practicing the music I am excited by the huge range of expression that is called for from the violin." LA-based pianist Richard Valitutto, who will perform a work by composer Amir Mahyar Tafreshipour, said that "we're all donating our time and energies to this event with the hopes that audience members will walk away a little more connected to humanity. This concert is a way to share and delight in the art and music of various individuals from Iran as a way to establish solidarity and support for the people affiliated with the nations on the 'banned' list." Click here for more information on the concert. March 13, 2017 at 02:19 AM · Well it is interesting and good to explore different types of music. I might go if I was in the area, since I do not know much about Iranian music. I just hope that "sharing delight in the art" and "establishing solidarity" will not mean dehumanizing people we disagree with (ie: people we accuse of valuing politics over art) without trying to understand why they think the way they do. Just my two cents, I did not expect to see something politically charged on this site (and I hope I won't again) but I may as well chime in. March 13, 2017 at 07:13 AM · Helen, you probably will, and with no apology. This site is about the art of music, among other things, and people are inspired to express themselves by many things, including politics. March 13, 2017 at 07:48 AM · I wasn't expecting this as the first reply to a wonderful project - didn't think this was "politically charged" until you saw fit to name it that way. Any country is in a sad state when the powers that be deny artists (and as I recently read in a science journal scientists too) the chance to enrich the world. This concert is a chance for people to create a positive from a negative and highlight music that would be rarely if ever heard let alone performed by western musicians. All power to the organisers/participants. I'm really sad I live in oz and can't get there (hopefully it will be videoed and end up on youtube...?). March 13, 2017 at 08:40 AM · I love this concert idea! We do not need to be hostages to the shortcomings or short-sightedness of any government. I would hope that as artists and musicians, we would open our hearts and minds to cultures different to our own which are often portrayed falsely in the media. We have much to learn from Iranian culture. March 13, 2017 at 08:48 AM · I love this concert idea.. And I do Hope to be there. March 13, 2017 at 08:49 AM · We certainly have much to learn from each other across culture. I am from Nigeria. March 13, 2017 at 09:32 AM · Okay Laurie, I understand. March 13, 2017 at 01:20 PM · Late last year (Dec 16) I joined (on piano) with a group of local pro and amateur musicians to provide a backing band (drums/bass/keys/sax) for the noted Iranian jazz/blues singer Rana Farhan and her longtime guitarist/arranger Steven Toub. The event was the local Iranian Student Association's Yalda Night celebration. Look for these in your area. We had a blast jamming and performing with Rana and Steve. Rana's niche is the setting of classical Persian poetry to bluesy tunes that she and Steve wrote. At our rehearsal the night before Rana talked a little about how she chose the verses, and she explained that there is an enormous trove of beautiful Persian poetry to draw from. Here's a good example. Unfortunately I cannot translate the text for you. I wish I could. March 13, 2017 at 07:49 PM · Paul, that's so cool. Guess what? I'm learning Middle-Eastern drumming now. I always focus on classical music only and never thought I would become a drummer, much less into middle-eastern rhythms. A new era for us, eh? Got to be thankful for being motivated to go beyond our old self. Regarding expressing political sentiment, we are all political animals, like it or not. Great musicians from Beethoven to Beetles all showed us that a musician has to their personal values and beliefs intergrade into the art they explore and create. March 14, 2017 at 10:56 PM · I only hope that this concert will be available on video afterwards. I so want to hear it! Wonderful idea!!!!! Kudos!!! March 14, 2017 at 11:46 PM · Its not the people but the government of both countries that disagree. Iran has a beautiful culture, and they are the most welcoming people. We are all citizens of Earth! March 14, 2017 at 11:47 PM · Lovely! March 19, 2017 at 12:59 AM · Indeed, as a previous poster wrote, “We are all political animals, like it or not.” I don’t ordinarily bring up political issues on this site myself. But when others do, directly or indirectly -- and I have no objection to their doing so -- I often chime in. What is “hateful” about wanting to ensure the safety and security of American citizens? I’m not saying all Iranians -- or all people from the other countries listed in the temporary ban, which is now on hold -- wish to do us harm. Far from it. But some clearly do. These countries were named -- by the previous administration, too, not just the current one -- as hotbeds of terrorism. I find it significant -- and predictable -- that certain individuals and groups, usually on the political left, are so quick to label as “hateful” or “hate speech” any views or opinions they disagree with. It’s getting old -- and it isn’t working so well for them these days. "Music is like water , it knows no boundaries."